STORRS, Conn. - Taking the ice for the first time this season, UConn fell, 4-2, in their exhibition match against the Shenzen KRS Vanke Rays on Saturday afternoon at the Freitas Ice Forum. Nineteen of the 21 on the Huskies roster saw game action in the match, as coach Chris Mackenzie got a first glimpse of his team in competitive play. The Huskies got on the scoreboard first, after junior Catherine Crawley found the back of the net off an assist from Taylor Wabick and Natalie Snodgrass in the tenth minute of play. Shenzen KRS then reeled off two-straight goals to round out the period, the first goal coming from Hannah Miller off a power play in the 16th minute. Emma Woods netted a goal in the 17th minute to push their lead to 2-1. The Vanke Rays got the scoring going early in the third period after Hannah Bunton received the puck off an assist and punched it into the net, giving them a three-goal lead. Hannah Miller's goal in the 15th minute pushed Shenzen's lead to 4-1. 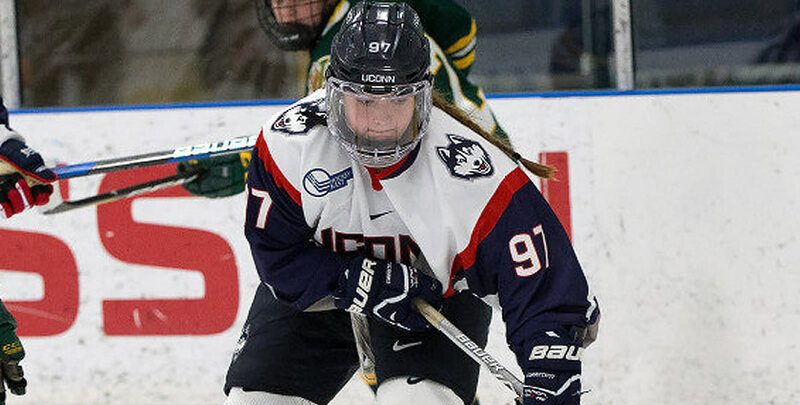 UConn was finally able to end their dry spell in the third period - In the 19th minute, Taylor Wabick found Rebecca Linblad for the goal, cutting the deficit to 4-2. Despite the loss, UConn held the shot advantage, outshooting Shezen KRS 30-24. Additionally, goalies Morgan Fisher and Samantha Carpentier-Yelle combined for 20 saves. UConn opens the season with a pair of weekend games against St. Cloud State on Sept. 28 and 29.